Meitu, the free Chinese photo app filling your Facebook and Twitter feeds with big-eyed, rosy-cheeked alien creatures, isn’t just for actual human beings. Witness the horrifically cute things it does to your favorite video game characters. Yeah, yeah, get the Billy Corgan references out of your system. And so I downloaded Meitu from Google Play, seeking revenge. After spending an hour unsuccessfully attempting to get the app to recognize our cat as a human being, I turned to video game characters, as one does. First came Nathan Drake, star of the Uncharted series. For this image I applied the Angelic filter. Not the most appropriate choice, but look at those eyes. My next victim is already one of the prettiest video game characters going, even with all the scars. Fairy Tale seemed a good match for The Witcher’s Geralt of Rivia. Now I was on a roll. I decided to try a character based on a real person, so I looked for pictures of Norman Reedus from the first trailer for Hideo Kojima’s Death Stranding. This turned out perfectly. The water droplet tears added by the Mermaid filter really drove that one home. I’m not a big fan of the New Year filter, with its odd little hands, but there’s just something about them coupled with the dirt-caked face of modern day Lara Croft. Overwatch characters are already cartoonish, so the Petals filter didn’t do much to Zarya, aside from shaving a little off of her jawline. My next target, Adam Jensen from Deus Ex, proved too elusive, as Meitu could not find a human face in his picture. See what happens when you use cybernetic implants? And so I turned to Hitman. Agent 47 demonstrates his uncanny ability to blend into any scene, even Meitu’s Fairy Tale filter. It’s all about that lipstick. Mafia III protagonist Lincoln Clay is transformed by the Baroness filter into a character from a teen drama on the CW. The actor’s 35, but he’s playing 18, and pulling it off (no he is not). Finally, I applied the soft and sweet Petals filter to Dishonored 2's Emily Kaldwin. This one would have worked much better had she been smiling, but I’m not going to tell her that. 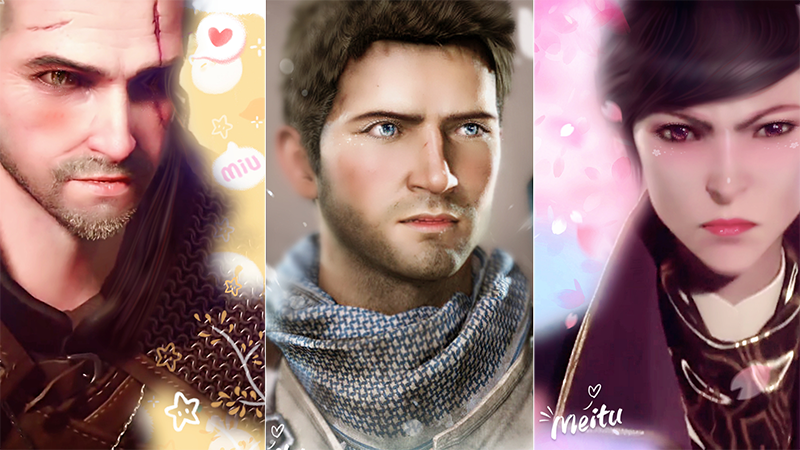 The Meitu app is available as a free download on iOS and Android, so there’s nothing stopping you from attempting to cutify your favorite characters. Share your creations in the comments!